Make a call for Hilda and Alirio! 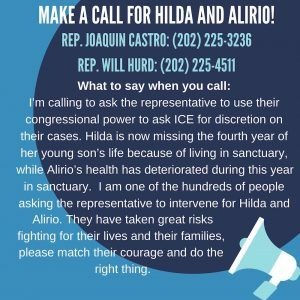 Hilda, Alirio, and their supporters are in the offices of Rep. Castro and Rep. Hurd calling on them to do everything in their power to intercede with ICE to exercise discretion so that Hilda, Ivan, and Alirio can finally walk free. We know that they have the power to make this happen. These three courageous individuals are fighting for their lives. Please call Rep. Castro and Rep. Hurd now! Please join us as we rally to ask Congressman Castro to step in to help Alirio, Hilda and Ivan gain their freedom from the constant and imminent threat of deportation. His office is inside the federal building and we are meeting outside at 11am. Today, please help us make a call to help Alirio, Hilda and Ivan become free from sanctuary and deportation!